While large conventions certainly have the ability to offer a wide variety of programming, dozens of guests, and huge artist alleys and dealer rooms, small conventions absolutely have their own charm and appeal. Last weekend, I attended the 2nd Annual Eastern Shore Fan Convention in Princess Anne, Maryland along with Heather and Nate of Zhobot and Denis. To be honest, we had no idea what to expect. All of us were fully prepared to walk around the convention for a few hours, take pictures, and leave. Instead, we were beyond pleasantly surprised. Other highlights included the game room and the Maid Cafe. The game room was filled with consoles and plenty of retro games that had many a person smiling from nostalgia while they played. 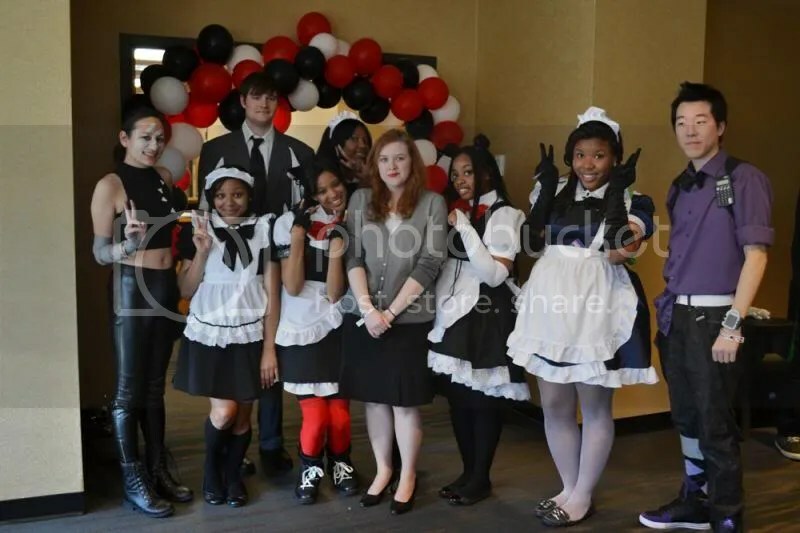 This was also the first time that I and my friends had gone to a Maid Cafe and we can’t say enough wonderful things about everyone who worked there. Apparently attendance numbers went up drastically from last year and therefore the cafes weren’t as well stocked with food as they’d hoped. However that didn’t stop any of the Maids from being incredibly sweet and adorable and making the entire experience enjoyable. There were also plenty of costumes present! The convention offered $2 off admission to anyone who attended in costume and a decent number of people took them up on it. The only thing I had issue with was the judging of the costume contest since I thought that there were several wonderful costumes that should have been recognized and at least placed. However, I do understand that judging can be rather subjective. On the other hand, the contest was quite fun to watch especially since so many first time cosplayers entered. All of them clearly had fun diving into the hobby. I was especially amused by the one guy who gave great credit to Amazon and his Visa card for completing his first cosplay. I’d be remiss if I didn’t mention the winner of the Children’s Cosplay Contest: Tiny Deadpool in a Dress. Yes that is exactly as adorable as it sounds and the small girl was AWESOME. As I mentioned above, I decided to wear my Echo costume again and it was considerably more enjoyable to do so in not-Atlanta weather although it did get a bit chilly when the sun went down. As always, I got to shoot with my favourite photographer, Heather! Enjoy a teaser shot from the shoot!